Are those penguins jealous of our human handshake gesture? Of course not, this picture is only a stroke of luck, but I found it very suitable to show that penguins too, can express a lot with their bodies. 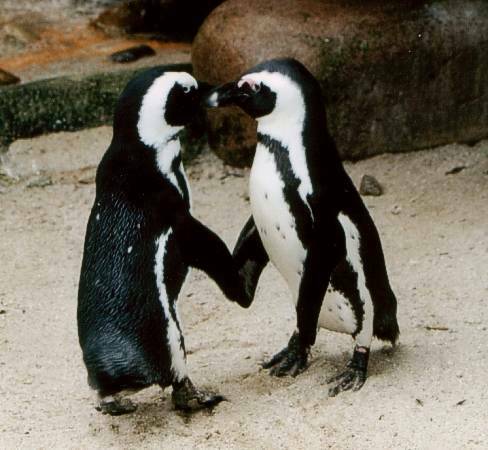 Even like people and a lot of other animals, penguins use a kind of "language" : a repertoire of poses, motions and sounds, which are (at least for a penguin) very recognizable and with whom they can make clear their intentions. How, otherwise, could they find their partner back? And an argument about nest material would probable end in a bloody fight. Among so many congeners, it is important that the birds know and understand each other. A study of those behaviour and "expressions" among animals is called behavioural sciences or - with a learned/technical word - ethology. It's obvious you can't go to a penguin and simply ask: "How are you? How do you feel?". You can only observe and interpret and try to link particular attitudes to specific situations. Of course it takes a lot of time to observe and you need to study many animals in different situations, before you can even try to understand their interactions. And you have to be careful not to humanize animals, as they aren't human, although some behaviour seems human. They respond instinctive to other birds and it is usually based on survival instinct and the urge to continue the existence of the species. They don't think but act while it is written in their genes. The behaviour between parent birds and chicks and vice versa. Also see breeding - chicks, while that behaviour occurs there too. Of course you can not completely separate those groups and therefore it will overlap sometimes.